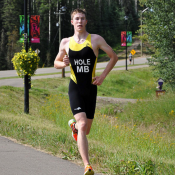 Darian Hole was introduced to triathlon after running success at an early age. He found the sport more interesting and complex than running, and has enjoyed its many challenges ever since. More than anything, Darian loves the variability in triathlon – every competition brings its own course, set of conditions and challenges, and forces athletes to adapt every second. Darian has had several memorable moments in his eight years as a triathlete, most notably finishing sixth at Nationals in the 2015 season. The result was not only his best result at a high-level race, but a good indicator of his progress and successful training. 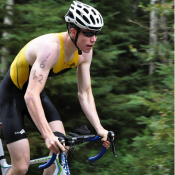 Beyond his results, Darian is most proud of how far his hard work has gotten him as a triathlete – particularly as a swimmer, the portion he had struggled with the most. Darian admires many former and current teammates, having learned valuable lessons from each of them. Most of all, he admires friend and fellow Manitoban Tyler Mislawchuk for his positive attitude and relentless pursuit of Olympic dreams. Darian has just finished his first year in the faculty of science at the University of Manitoba, and hopes to continue his training while learning a subject he is passionate about.